The Great Barrier Reef’s ecosystem is incredibly rich, and even though you might not be, it’s a world wonder simply not to be missed. Undoubtedly, you’re in for a splurge on the airfare to get Down Under, but, happily, once you touch down, there are plenty of value Great Barrier Reef activities that won’t break the bank. Base your stay, like I recently did, in the well-serviced tourist center of Cairns or on Fitzroy Island, just offshore, and look out for these great ways to encounter the reef on the cheap, along with a couple of budget-friendly lodging options. Visit an Offshore Island: The coastlines of the coral reef-fringed tropical islands set just outside of Cairns are prime for swimming, snorkeling, and relaxing on the beach. Great Adventures offers eco-friendly (both ecologically and economically) day trips out to the lush 37-acre Green Island, inclusive of catamaran transfers (about one hour each way), snorkeling gear rental or a glass-bottom boat tour, buffet lunch, and self-guided rain forest walks (from $88/adults). Or, try reef-meets-rain forest Fitzroy Island, for plenty of water-based diversions and short hikes in the national park reserve; stick around for the night on the budget-friendly onsite campsite (see below). Raging Thunder offers day trips from Cairns centered around snorkeling and sea kayaking tours of the island (45-minute transfers; from $102/adults, including lunch, snorkeling gear, and more). Snorkel: There are countless snorkeling opportunities on the reefs, be it from the back of a boat (try the full-day cruises offered by Compass Cruises, with unlimited snorkeling and buffet lunch thrown in the mix; $104/adults) or off the coast of an island. Plus, rental equipment typically won’t cost you more than $15 (better yet, bring your own). Getting face to face with the world’s largest living entity means clear-water encounters with colorful coral gardens and a staggering number of 1,500 species of fish. Scuba Dive: The Great Barrier Reef is pretty much hallowed ground for scuba divers, and if you’re not yet certified, but looking to take the plunge, it provides the perfect terrain for dive training. Get PADI certified with Cairns Dive Center’s (CDC) 3-night Learn to Dive course, which for $544 gets you boat transfers out to the dive center’s outpost on Fitzroy Island, four island training dives, and a two-dive day trip to the outer reef. If you’re already certified, hook up with a budget-friendly full-day tour on a dive boat like Silverswift, offering a smooth-sailing modern vessel, knowledgeable crew, and time to take in several Outer Reef sites. Rates include either two introductory dives or three certified dives (or, alternatively, unlimited snorkeling); plus, lunch and snacks ($205/adults). Kayak: Use your own paddle power to get out on the reef. The CDC on Fitzroy Island offers hourly rentals of kayaks for two with nifty glass-bottom windows for peeking through to the seabed as you paddle (from $26/hour). Glass-Bottom Boat Tour: A glass-bottom boat tour is a fun way to take in underwater panoramas without getting wet. Try Fitzroy Island’s evening boat tours for an unusual reef encounter come nightfall ($26/adults). Camp on Fitzroy Island: With the coral-pocked coastline as your front yard, camping on a Great Barrier Reef Island offers terrific value and unbeatable real estate in a secluded tropical paradise. Folks who pitch their tent on Fitzroy Island ($34/night per pitch, for up to four guests) can wake up to snorkeling with marine life like sea turtles (or learn more about them at the newly opened Turtle Rehabilitation Center just next door; daily guided tours with donation), and get access to the island’s national park-designated rain forest trails. The Cairns Dive Center here offers competitively priced dives, glass-bottom boat tours, kayak rentals, snorkel equipment, and more. 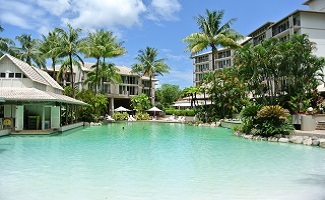 Cairns Novotel Oasis Resort: Centrally located in Cairns, this 314-room resort offers spacious, contemporary rooms, an enormous sandy beach-fronted swimming pool, and great-value extras like free stays for kids, parking, and Wi-Fi in the lounge (from $156/night).